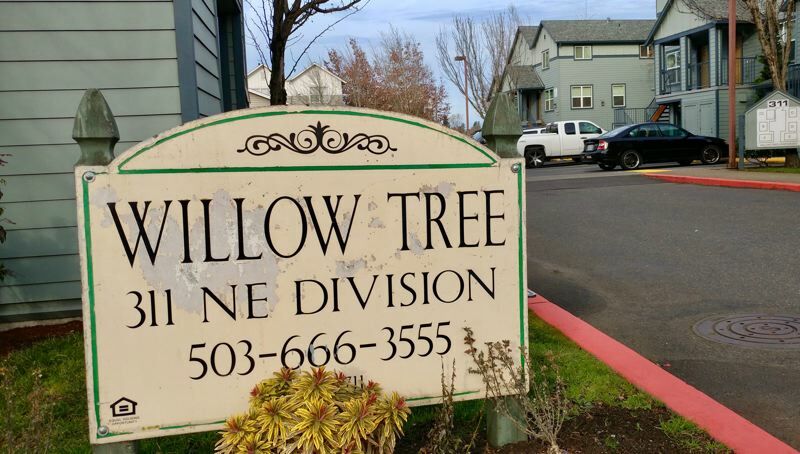 Lawsuit stems from exhaust fan running at Willow Tree apartments on Division Street. Reader's Note: The bathroom fans were incorrectly referred to as industrial strength. The amount of the resident's electricity bill was attributed to them. A Gresham couple continues to push for their rights after allegedly facing high utility costs and health issues while living in a Gresham apartment complex. The plaintiffs, Robert J. Nicholson and Dianne Hebert, filed a civil lawsuit on Dec. 18, after issues they faced living at Willow Tree apartments, 311 N.E. Division St. The lawsuit names Home Forward, Walsh Construction Co., Human Solutions Inc., Cascade Management Inc., Affinity Property Management LLC, Willow Tree Apartments and Leah Colette Sykes, Attorney at Law, as the defendants. The couple is representing themselves in the case because of the high cost of legal fees. The main cause of concern for the couple are the fans that run 24/7 in their bathroom. From early 2012 to early 2013, the Willow Tree apartments were all retrofitted, pulling existing bathroom fans for newer models. "The bathroom fans installed at the Willow Tree apartments, during a significant property rehabilitation, are the current industry best practice to improve indoor air quality for our residents," said Tim Collier, director of communications for Home Forward. According to the lawsuit, the fans were hard-wired to run 24 hours a day, without residents having any way to turn them off. The fans were operated through the tenants' lighting circuits, the lawsuit said, meaning the residents had to foot the bill. The couple said at no point were they told about the fans or electricity issues, with neither appearing on their lease. They were placed in the unit by Human Solutions after spending some time in a shelter. "These people aren't creating pathways out of poverty," Nicholson said. Their apartment is a two bed, one bath, 860-square-foot unit with no washer or dryer. According to the couple, their electricity bill last month was $223. "Only one unit has made a complaint about increased utility costs since the 2013 rehab," Collier said. The plaintiffs also cite problems with the fans drawing in outside air through negative air pressure. According to the lawsuit this led to dust, pollen, mold spores, ash smoke, moist-air, insecticides, volatile organic compounds and much more being drawn into the apartment. The lawsuit cites this as the reason behind Nicholson's pulmonary health deteriorating, leading to a hospitalization in April 2017 for asthmatic issues. The plaintiffs asked for air quality tests to be conducted in the apartment because of a fear of toxins, after discovering a significant mold bloom in their storage unit and tar residue around their window. Though those tests have been completed, they said no one will show them the results. "For people well below the federal poverty line, all of this doesn't make any sense," Nicholson said. Home Forward said it hired an engineer to review whether the fans could pull air in from outside, and determined that is not occurring at Willow Tree. The couple applied for a reasonable accommodation, at the behest of Nicholson's pulmonologist. The form asked for fan switches to be installed so the couple could regulate when the bathroom fans would be running. Issues surrounding that request is what led to the plaintiffs filing the suit. "We will stand up for ourselves and our rights," Nicholson said. "We spent seven months of begging with them to do something before turning to the lawsuit." The couple originally only wanted two fan switches to be installed and the results of the air quality tests. Now, because of a series of reports and complaints from the plaintiffs being unsatisfactorily dealt with, they are seeking $100,000 in emergency injunctive relief to move to a new residence, identity theft protection services for the rest of their lives, compensatory damages, punitive damages, exemplary damages and future damages. "Only one unit has made a complaint about increased utility costs," Collier said. "In response to this complaint, we have requested further documentation to be sure the unit's utility costs have increased." Nicholson and Hebert countered that point by saying many of their neighbors face the same problems, but are too afraid to speak up. "Some of Gresham's most vulnerable live here, which is why no one is talking," Hebert said.